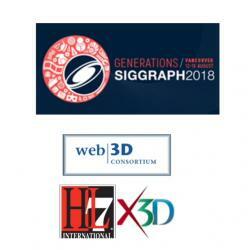 SIGGRAPH 2018 (August 11- 16) in Vancouver, Canada is the world’s largest, most influential annual conference and exhibition in computer graphics and interactive techniques: Five days of research results, demos, educational sessions, art, screenings, and hands-on interactivity featuring the community’s latest technical achievements, and three days of commercial exhibits displaying the industry's current hardware, software, and services. Web3D Consortium members have several Birds of the Feather (BoF) discussion sessions on August 13 and 15 showcasing Web3D's X3D open standards as the backbone for the new dimensions of 3D! Deploy 3D from any domain to any platform!!! These BoF sessions are also listed on the SIGGRAPH 2018 BOFs page.